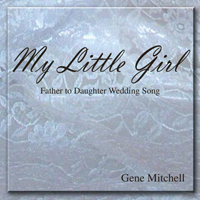 My Little Girl is the perfect song for a Father-Daughter wedding dance and the perfect song for the Father to sing to the Daughter. Piano/Guitar sheet music is available along with a CD of the music played on piano for a background music accompaniment track. Also available for download at iTunes, click here to download. "A cup for me, Daddy, here's one for you"